I’ve been a happy user of AWeber for over 6 years now and I can wholeheartedly say that Aweber has been responsible for over 90% of my revenues. This year, my blog will make well over a million dollars primarily because of email so it’s extremely important for me to stay on top of my email provider choices. Now normally, I have a “don’t fix it if it ain’t broke” mentality so unless I have a specific pain point that is not being addressed, I tend not to change. For example let’s say you want to hold a webinar every month. With AWeber, you would email your list and solicit interested parties onto a separate list for each one. Now let’s also assume that you get 2000 people signed up for each webinar. Over the course of the year, you will have 12 * 2000 = 24,000 duplicate subscribers on your various lists that you would have to pay extra for. Not only that, but it’s extremely tedious to have to create a brand new list each time. Ideally, I should be able to tag each existing subscriber to indicate that they are interested in my webinars without going through all of this hassle right? Note: I’m still in the evaluation phase and am currently paying for both AWeber and ConvertKit. This is definitely not going to be a ConvertKit rah-rah type of post as I’m going to thoroughly break down its advantages and disadvantages. Which Is The Better Provider? I became attracted to ConvertKit mainly because it organizes your subscribers in a fundamentally different way than AWeber. Instead of operating under the notion of separate lists of subscribers like AWeber, ConvertKit works based on tags. Adding tags to subscribers is as simple as having them click on a link. Currently under AWeber, I have to make subscribers fill out a brand new form to get them on a separate list that I end up double paying for. The entire email list/form setup plus integration on my site takes about 30 minutes of my time. Then I have to make people go to a special landing page where they enter their email address again! But with ConvertKit, I simply have my subscribers click on a special link and they are instantly invited to my webinar. I don’t get charged anything extra. This subtle distinction is extremely powerful. Here’s another example of how I’m currently experimenting with ConvertKit. As people traverse through my email autoresponder sequence, I’m tagging each individual user based on their interests and what they click on within an email. With this information, I can instantly segment my email list on the fly and only send the right email to the right interested parties. I can even trigger brand new autoresponder emails based on what a person clicks! This is the #1 reason why I’m considering the switch to ConvertKit. You get the best and most powerful features of InfusionSoft and Ontraport at a MUCH lower price point. In fact, ConvertKit costs pretty much the same as AWeber. Now with everything I just told you, why haven’t I made the switch 100% over to ConvertKit yet? Why am I paying for 2 email providers? With every tool or product, there are always hidden pros and cons that you will only discover after going in depth and actually using a service to its fullest. Note: I will continually update this list of ConvertKit disadvantages as each feature is added or fixed so this post will be up to date. And Nathan, if you are reading this, I’m holding you accountable here. To begin the list of disadvantages, I’m going to start with the show stoppers first followed by the nice to haves. First off, ConvertKit does not let you clear out subscribers who have not opened an email in a long time. Right now, in order to cull your list (which I recommend doing every 6 months), you have to send an email to ConvertKit and have them do it for you which is a pain. Since I currently use single optin on all of my email lists, I regularly remove inactives in order to keep my list fresh. Without this feature, over time you’ll end up with a less engaged list. In general, AWeber is much more mature than ConvertKit since it’s been around much longer. Right now, ConvertKit is missing some key segmentation options. Which message they are on in my autoresponder – I use this quite often to target specific users based on what they just read. Which webpages they have visited on your site – I occasionally use this to target emails based on what posts people have read on my site. If you are running single optin on your lists, one of the primary concerns is spam. For example, what if a malicious user starts signing everyone up for your list? Currently Aweber has safeguards to prevent this from happening including CAPTCHAs and IP detection. ConvertKit has no such safeguards. The following are nice to have features that AWeber has that ConvertKit lacks. In the grand scheme of things, these are just annoyances and most have workarounds. Note: Some of these complaints are super nitpicky as you’ll see:) It just depends on how particular you are. Since 90% of my revenue is from email, I’m pretty picky. If any of you run a popup email form on your blog, this might be a concern. Currently, I have my popup show up only once per user after about 30 seconds. And the way this is enforced is by putting a cookie on the user’s computer to indicate that they’ve already received the popup. During my testing, I noticed that ConvertKit inserts the cookie as soon as the person lands on the page and NOT when the popup appears. As a result, if a user navigates to a different page before the popup happens, they will never get the popup. I’m sure this will get fixed soon(hopefully) but right now there’s no way to send test emails on your autoresponder emails. Instead, you have to rely on the email preview option. This is problematic for me because I like to see how an email looks on mobile and tablets prior to sending and the best way to do that is to send a test email. Right now with ConvertKit, when someone unsubscribes from any email that you send, they are completely gone from all of your autoresponders and lists. For example if I have a main autoresponder list and a webinar list, a user might ONLY want to unsubscribe from one list and not the other. However if they unsubscribe from one email, they are automatically wiped out from all future emails. I would like the ability to only unsubscribe from certain lists and not others. Currently at the bottom of all my emails, I remind the user where they signed up, when they signed up and what post they were reading when they signed up. By including this information, I have reduced the amount of spam complaints dramatically for my emails. Unfortunately, ConvertKit does not allow you to add this information to emails just yet. As a result if the ConvertKit servers were to ever go down, it could potentially prevent your site from loading. I wrote about his happening to my site before (Click here to read the post). Whenever I add a new autoresponder or a new form to my site, I like to test the performance of different positions on the site. While ConvertKit provides great stats in this regard, they can not be reset. For example, if I make changes to my autoresponder emails, I can’t reset the stats. Likewise with my email forms, I have to create a new form to get fresh stats. This is a really tough question to answer and it really depends on your needs. Right now, AWeber is more mature than ConvertKit and is generally a more polished product. But the tagging features of ConvertKit are super compelling, so much so that I’m on the verge of going 100% in on ConvertKit. The ability to tag users, easily move people around based on their interests and not getting double charged for subscribers is HUGE! Also, ConvertKit ends up being cheaper than AWeber too once you exceed about 40000 subscribers. But AWeber is less expensive for new users. Ultimately, you have to make your own decision but you can’t go wrong with either provider. If you think you’ll end up selling a bunch of different products where segmentation is crucial, then go with ConvertKit for sure. If all you want is a robust email service that’s been around for years and is slightly cheaper for beginners, then go with Aweber. I knew about aweber from my web design clients, but never liked it (back then the subscription forms were pretty ugly and the code a mess). I am using Mailchimp right now, but will look into convertkit, seems interesting. How does ConvertKit compare to Klaviyo? I know you are a fan of it, is it only really eComnerce or would it work well in a general setting against one of these two? Klaviyo is a completely different service specially designed for ecommerce and is what I use for my shop. For selling a variety of products, Klaviyo is superior in every way but it’s also twice as expensive. The 2 services I evaluated above are primarily for bloggers. In theory, you can use it for an online store but you’d be missing out on a lot of features. I’ll do a Klaviyo review at some point in the future. AWeber’s list management logic has always seemed flawed to me – it’s far more logical to tag a single email address with multiple interest tags, rather than count each interest as a separate subscriber. Thanks for the comparison review on ConvertKit – it sounds like they are on the right track. Klaviyo looks like a good merchant email system, and I’ll look forward to your review of it. They could use a mid-tier pricing level, IMO – the jump from 500 to 15,000 subscribers is a big one. I agree. The reason I like ConvertKit too is because I trust the founder, Nathan Barry. Incidentally, his podcast interview comes out this week. Thanks for sharing about ConvertKit. What an awesome tool! By the way, if you’re interested in segmenting, you should also check out AW Pro Tools. I believe it only works with Aweber though. 1. What if someone subscribed to your list, and years later they got annoyed by your email, and hit the “Spam” button, forgetting that he subscribed? In the event of spam accusation (either by your autoresponder company, your ISP, the FTC, etc), how would you defend yourself though, if he was subscribed via single opt-in? I mean, with double opt-in, you’d be safe because you’d have a proof that he clicked the confirmation link. But with single opt-in, how would you protect yourself against false spam complaints? 2. One of the most successful internet marketers out there personally told me that in the past he used to use single opt-ins. But one day someone subscribed using a spam-trap email address, and that got him into big, big trouble. Basically, since it was a spam trap address, basically all emails sent to that address are considered spam. Since that address was subscribed to the marketer’s list, the emails he sent that address ended up getting tagged as spam emails, and that’s what got him into big trouble. Not sure what the trouble was, and not sure whether it was with his ISP, or the FTC, but I remember it was pretty scary. Any tips on preventing this potentially scary issue? I’d love to use single opt-ins too as it converts better….but I still haven’t done it because I keep worrying about the potential (legal) issues. These are definite concerns. With my Aweber emails, I usually include the date of signup and what post/form was used for the signup to remind the reader. Usually, the providers should have safeguards in place to prevent malicious use from happening. For example, Aweber uses captchas and double confirmation when it feels as though the address could be spam. CK doesn’t have this yet. Yes, that is the workaround mentioned in the article. The caveat is that you must have a global unsubscribe all link in addition to a separate unsubscribe link for the list in question. Ideally, you would only have one. Wow- thanks for the super thorough post Steve! I’m curious though, I just switched over from MailChimp to MadMimi and I know those are big players too, but I didn’t see them mentioned here. Are they drastically different from aWebet and ConvertKit? Thanks for this very interesting in depth review! I agry that the tagging feature of the Convertkit is a very interesting tool, specifically if it manage not to finish with a duplication of subscribers in the list. But I wonder if you have compared many more email marketing service providers. I am in the process to move from Mailchimp to a paying option (I definitely have not a list as big as yours) and, for the beginners, Convertkit seems to be one very expensive option in the market. I am shopping right now about this subject and I found that Getresponse offers a lot a value and the same (if not more) features than Aweber or Convertkit for a better price. Did you analyse other companies as Getresponse? If yes, I would certainly like to know your opinion about them (especially Getresponse). Thanks! Good review, Steve. I recently completed an in-depth review of email automation tools for a client, and another good candidate was ActiveCampaign. Convertkit was a contender too, but what won us over on ActiveCampaign was the depth of the marketing automation tools. AC is also available at a very reasonable cost for smaller lists, and also has a complete CRM solution on the back end for those that need it. ActiveCampaign’s programmatic flexibility starts getting into Infusionsoft territory. 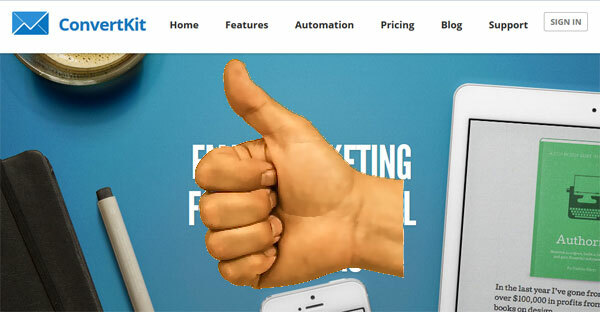 It doesn’t have all the features of Infusionsoft, but the marketing automation features are similar. As list size increases so do costs, so list size is a consideration. ActiveCampaign is worth adding to the list. This particular client was an AWeber client from way back, but the issues you mentioned (especially duplicate subscribers) were a real thorn in his side. As part of the research process I talked to AWeber, and apparently they are trying to catch up with a new tags-based capability coming out soon. It won’t apply retroactively, but should make them more competitive going forward. 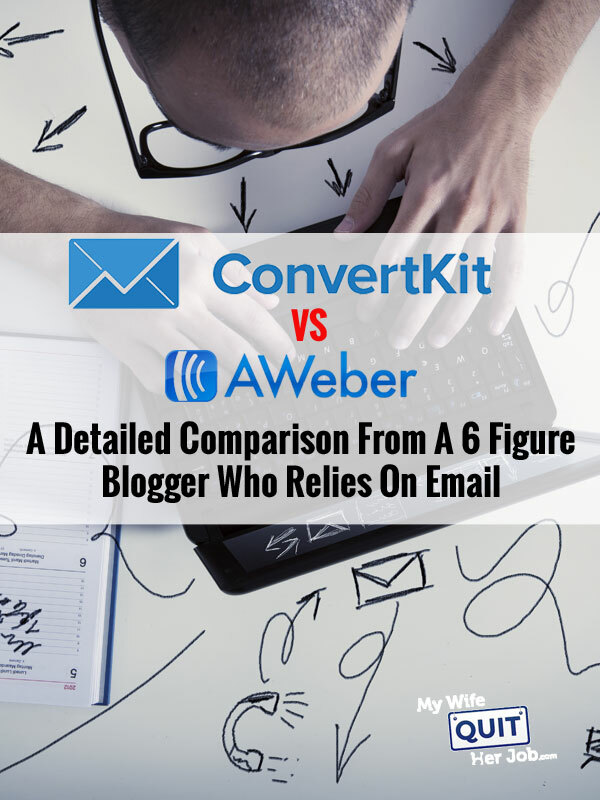 Steve – I am currently considering a move from Aweber to ConvertKit and I’d love to know how ConvertKit is working out for you now (today is 3/16/16). Have you made the full switch from Aweber? Like you, I hate to make a move that doesn’t create a lot of value so I’d really appreciation your most recent thoughts. That is a loaded question and here’s my answer. If Aweber had all of the tagging features that CK has, I would stay with Aweber. Aweber’s UI and capabilities are much better as a pure email provider. But the CK features outweigh all of its shortcomings so I’ve pretty much switched over at this point to CK. However, I still maintain a small Aweber account in case I ever decide to switch back. As I wrote in my comment few days ago, I am shopping to choose an email marketing company. Following the comment of another Steve below, I contact the support of Aweber and they confirm me they already add some tagging features and all the tagging features will be implemented in the next few months, including IF-THEN rules like CK, no more duplication of the list (ability to contact segments of the list using tags), etc. Whith all that, I think that, considering the other features Aweber offers more at a lower price, it will be a better choice comparing with CK. Thanks so much for the reply! That helps a lot. I am a relative newbie to email marketing and advice from someone with your experience is greatly appreciated! Please let me know if I can ever return the favor. Hey Steve, I like your break down, and it’s definitely beneficial as I’m also considering the move from aweber to convertkit. What is your take on it now that Aweber has introduced “campaigns”? Does that change your mind at all? It seems now that they have implemented campaigns and tagging that maybe it wouldn’t be worth the hassle to move to convertkit. Convertkit also has me interested in the landing pages they offer, potentially cutting out the need for leadpages or other alternatives. Curious about your thoughts, and whether you’re still all in for convert kit. I’ve been in close contact with Aweber as well as ConvertKit. Right now, Aweber’s campaign functionality is not as powerful as CK, however they are working on it. The main problem with CK is that they have very poor subscriber management functions. For example, if I want a list of unopens within a certain date, or if I only want subs in California, I can’t get that. For now, I’m still using both services for completely different functions just to keep feet in both doors. It might interest you to know, Aweber have recently removed the option for single opt-ins for new users. The feature can ONLY be manually switched back on by support, and they refuse to do it until you’ve generated a decent number of double opt-in subs. Even though I tend to use double, I will not use Aweber. Consider you’re selling access to a membership site, and automatically adding users to a list. With Aweber, not only will you want to send out an email containing their login info, but you’ll also need each user to manually confirm their subscription to your list, via the ugly email Aweber sends out. Thanks for an in-depth review! I’m also considering GetResponse as it offers now marketing automation. I’d love to see a review of this one compared to either Aweber or ConverKit. I’d love to hear updates about your 7-digit business this year, Steve. These list-based backends like AWeber/MailChimp have bothered me for some time as well and I stumbled upon SendX(http://sendx.io) though ProductHunt. I’m hooked to these new-gen email marketing providers and the offerings they have. ConvertKit also does look great but, for my list size I think SendX fits my budget more. Also, they have a set of nifty widgets on top of CK’s offerings. All the same, I’d surely want to have a feel of both the products before migrating entirely to one. 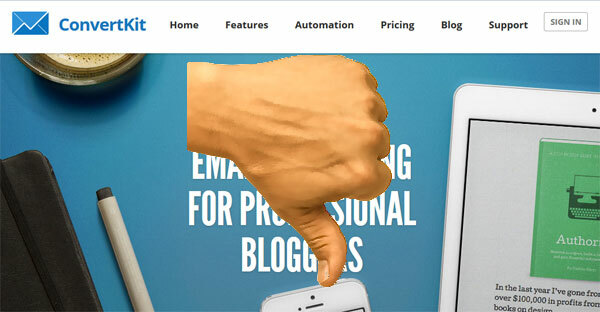 I see the pain in using AWeber/MailChimp in so many blogs in similar ways that I’ve faced myself. I hope you all the success with your blog and using ConvertKit too.